Red Flannel Hash named one of the Top 10 Local Recordings of 2015 in Seven Days! Happy to have made the list with many of Burlington’s best bands! They also posted our music video for “The Original Original”, scroll down towards the end of the article to check it out! Black Rabbit named Best Rock Artist/Group in Seven Days! 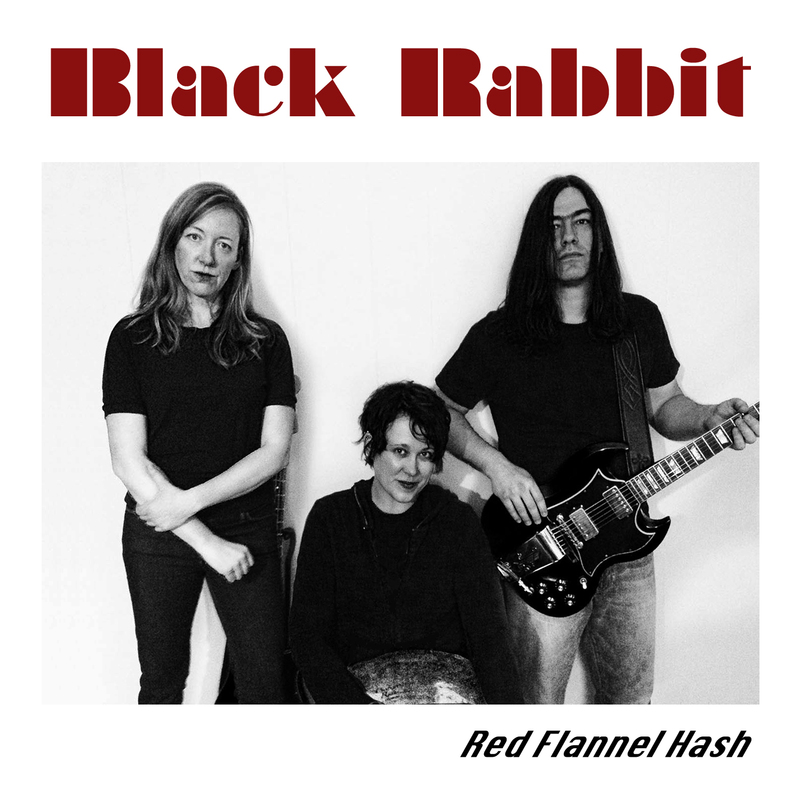 On their 2013 self-titled debut EP, Burlington punk trio Black Rabbit offered a glimpse of the band they might become. Though a tad derivative in moments, the brisk, five-song recording suggested a budding promise within the minds of husband-and-wife duo Marc and Darlene Scarano. On their latest effort, the recently released Lipstick and Dynamite, Black Rabbit take a bold, steel-toed-boot-clad step toward realizing that potential. As on their first record, Black Rabbit remain rooted in 1970s punk and bands such as the Ramones and New York Dolls. But on their latest, they use the iconic sounds of those bands merely as a launching point to explore new avenues. The result is a self-assured and markedly improved album that finds Black Rabbit beginning to truly forge a unique identity. In particular, front man Marc Scarano boasts a previously unseen swagger. The easy confidence of his disaffected drawl is compelling and infectious. On opener “Black Cat,” he snarls with quiet menace over an insistent punk groove. This eventually steamrolls into a proggy, psych-rock breakdown that comes out of left field yet is not too jarring. “Tarpaulin” coalesces around an efficient guitar riff that sounds like an outtake from the Strokes’ Is This It — and that’s a good thing. The song itself has more in common with Surfer Rosa-era Pixies, especially in the call-and-response section between the Scaranos. “Mark My Words” may be the most bracing two minutes of music you’ll hear from a local band this year. It’s followed by the equally aggressive “Rejected,” on which Darlene Scarano tempers her husband’s sneering vocals with poppy, beach-blanket backing vocals. Lipstick and Dynamite vastly improves on its predecessor in production. While Black Rabbit’s debut had a degree of lo-fi charm, Robot Dog Studio’s Ryan Cohen masterfully tweaks the knobs and faders this time, presenting the band with greater fidelity without losing any of its grit or punch. Nowhere is this more evident than on the album’s last two cuts, “The Invisibles” and “Carnage.” In particular the aptly titled closing track assaults the ears with a tsunami of guitar crunch and thundering drums — the latter courtesy of drummer Mark Tomase, whose performance is understated but wildly effective throughout. Tomase has since left the group and was replaced by the excellent Jane Boxall, of Doll Fight! and Steady Betty renown. Given Boxall’s aptitude for punk drumming — not to mention her general elite musicality — we might assume the improvement found on Lipstick and Dynamite is only the beginning for Black Rabbit. Stay tuned. Lipstick and Dynamite by Black Rabbit is available at blackrabbitvt.com. Black Rabbit play the Monkey House this Thursday, July 24, as part of the Girls Rock Vermont! showcase. Local alt-weekly Seven Days reviewed our CD this week! Very excited that they name-checked so many bands that we love! Black Rabbit’s self-titled EP is infrequently original, but it’s the debut of what might be one of your future favorite bands. The Burlington-based, husband-and-wife-fronted garage-rock trio is an excellent addition to the Queen City scene, and on Black Rabbit EP the three introduce themselves with an honest handshake. The album takes you on a short but bracing five-song ride from the garage to the road. Taking cues from the Misfits and Hüsker Dü, Black Rabbit lean on the punk-rock side of business. The fitting starter, “Tibbar Tibbar,” leads with an aggressive burnout and screeches off into the distance with wild guitar solos. “Neighborhood” recalls 1970s punk popularized by the likes of the New York Dolls. As Marc Scarano belts out a brief story about a modern-day criminal, bassist Darlene Scarano nails the backing vocals while delivering a firm low-end foundation. She sings and plays with simplicity and is rhythmically solid. Meanwhile, drummer Mark Tomase takes a classic, straight-up approach to keeping things in order. The Scaranos’ vocal harmonies work well throughout, highlighting an important element of any good garage-rock band: a haphazard and passionate collaboration of audacious vocal deliveries. “Things Change” showcases Marc Scarano’s cut-through guitar licks as well as his vocal prowess as he insists, “That’s the way I am, like it or not.” His high-toned delivery of the line sounds more like Brian Johnson of AC/DC than, say, Glenn Danzig. “Eighty Nine,” the EP’s slacker-rock centerpiece, could be mistaken for a cut from a 1990s Sub Pop Records sampler. Loaded with unwieldy vocal hooks, the song establishes itself as a clean, California-style tune. “Neutrino” is a suitable closer to Black Rabbit EP. It offers the repetitive but well-loved guitar riffage of ’90s bands such as the Breeders, but Black Rabbit omit unnecessary embellishments — for example, reverb is almost nonexistent. That bare-bones aesthetic signals an authentic, raw approach that bodes well for the band’s future efforts. Rumor has it Black Rabbit will release new singles in the coming months. In the meantime, Black Rabbit EP is available as a free download at blackrabbitvt.bandcamp.com.